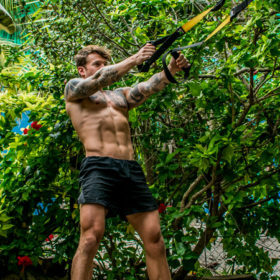 TRX leg exercise for building strength. 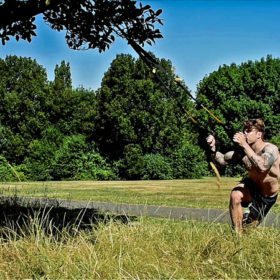 Using a mate or partner is a great way to add weight for strength training using a TRX and body weight. Plus it’s a laugh. We’re in a London park on a gorgeous day here, London really is a beauty when the suns out. Frida (www.themoonontheotherside.com) is my weight and counter balance. Control is key here. Take it one rep at a time and keep tension by going down slowly and exploding up. Failing that just put a rucksack on your back.